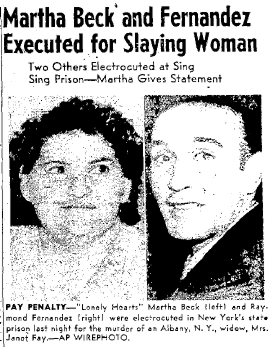 Martha Beck and Raymond Fernandez, commonly known as the Lonely Hearts killers, were executed today in Sing Sing Prison's electric chair. The couple, who were romantically involved, had deceived lonely widows to gain access to their money. Fernandez seduced the women and then stole their possessions, while Beck posed as his sister. Yet, what started as fraud soon turned into murder. "Mrs. Beck and Fernandez were electrocuted for bludgeoning and strangling Mrs. Janet Fay, 66, an Albany, N.Y., widow, on Jan. 4, 1949, at their apartment at Valley Stream, N.Y. Mrs. Fay had entrusted $5,900 of her life savings to them after she had met Fernandez through a Lonely Hearts club correspondence. The widow was slain after she became suspicious, and demanded that Fernandez prove his love for her," explained The Lowell Sun on March 9, 1951. The number of women murdered by Beck and Fernandez are unknown, but at least three deaths were documented and the couple had allegedly confessed to 12. Prior to their execution, the two had "expressed their undying love" to each other. "My story is a love story," said Beck, as quoted in The Charleroi Mail. "But only those tortured by love can know what I mean." Martha Beck, a child killer, was always good for some syrupy, stomach-squeezing quote about love. Right up to the end. We have her to blame for their keeping this case ranking right up there on the list of infamous lonely hearts killers. Not to be confused with "help wanted" killers or "rooms for rent for World's Fair" killers. There were many other killers who lured men and women specifically with lonely hearts ads. Belle Gunness was another one, and she killed children, too -- her own. But as true crime writer Mark Gribben recently mentions in The Lonely Heart Family, sometimes the kids get in on the act. For more on Beck and boyfriend, see Frances Farmers Revenge on Beck & Fernandez and a detailed review of the movie The Honeymoon Killers about Beck and Fernandez. A lovely couple! Favorite Martha quote - "Only those tortured by love can know what I mean". YOu can alomst here the organ music. THE HONEYMOON KILLERS is a fabulous movie. You have to see it! I can't believe I never read this on here! I knew two policeman who were both working at sing sing at the time of the love bird's execution (i'm not usually this insensitive, but after all--)! and they told me the condemned were writing syrupy love letters right up until the end. Yuck! I mean sometimes capital punishment is sooo right!